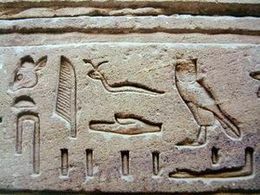 ^ Egypt, Ancient: Hieroglyphics and Origins of Alphabet. Encyclopedia of African History Title information. [12 September 2012]. Allen, James P. Middle Egyptian: An Introduction to the Language and Culture of Hieroglyphs. New York: Cambridge University Press. 2001. ISBN 9780521774833. OCLC 51226851. Brewer, Douglas J.; Teeter, Emily. Egypt and the Egyptians. Cambridge: Cambridge University Press. 2007. ISBN 9780521851503. OCLC 433993212. Kamrin, Janice. Ancient Egyptian Hieroglyphs: A Practical Guide. New York: Harry N. Abrams. 2004. ISBN 9780810949614. OCLC 55019226. Robinson, Andrew. The Story of Writing: Alphabets, Hieroglyphs & Pictograms. London: Thames & Hudson. 2007. ISBN 9780500286609. OCLC 172818065.